My husband E likes to give big gifts. Extravagant gifts. Thoughtful gifts. Like a patootie-kicking mountain bike. A week in Paris. A Macbook Air laptop tucked inside a vintage leather messenger bag so I can call the city’s endless park benches and sunny stoops my office. I veer toward less pricey gifts. Practical gifts. Gifts inspired by a farmer’s daughter’s frugality. Like a virtual surprise birthday party with friends scattered across several continents. A private bourbon tasting of rare bottlings for him and a buddy so he knows exactly which brands are worth the splurge. And, this past Christmas, plastic utensils. Uh, let me explain. Last December, the loss of a loved one left us thinking presents weren’t exactly a priority. Still, I thought coming home to a little something under the tree–left bare in our rush out of town—would perhaps create a moment of loveliness, something to help soothe our raw and frazzled edges. So I did what I, and every rational, rationalizing woman I know, instinctively do when circumstances scream for some measure of found happiness. I splurged at Anthropologie. It was a modest extravagance, as extravagances go. A set of six steak knives. Steak knives that were swoon at first sight. Steak knives that flaunted stately blades of sturdy stainless steel and curvaceous handles fashioned from, of all crazy things, lollipop-colored PVC. The knives are crafted by forge de Laguiole, the legendary French house whose artisanal craftsmanship can be traced back two centuries and whose unparalleled elegance I’d coveted the past two decades. Though the company tends toward more masculine designs drawing on wood handles, a nod to their beginnings as makers of pocket-knives for sheepherders, this psychedelic set was unlike any other Laguiole creations I’d seen. Yet I’d recognized that luxurious curve immediately. Utensils, yes. Utilitarian, not so much. At least not to me. E’s reaction as he unwrapped the box was one of…well, his response wasn’t exactly swooning. Let’s just say it was one of surprise. Bemused, eyebrow-raising surprise. Holding a slender knife—the magenta one–daintily in his rugged hand, his expression said everything. Flimsy. Silly. Girlie. “They’re not terrible,” he finally said halfheartedly. I kept them anyways. Call it woman’s intuition, call it the lure of something unabashedly and irresistibly bohemian, call it me just knowing my man and his patience for what I find to be lovely. All it took for E to appreciate Laguiole’s stylish blade and its ability to slide through a single steak—rib eye, grass-fed, washed down with bubbly—as if it were silk. He’s since come to appreciate the knives more, having experienced how they work just as deftly on takeout chargrilled chicken from across the street and, quite frankly, how the colors on our wooden dining table please me. Now he finds any excuse to use them, such that I let our Lauguioles out on the counter, their jaunty handles jutting out of an antique canning jar, mostly because I like to watch E as he muses over which color he selects on a given night. Although as befits the thoughtful guy that he is, he always lets me select first. I have to say, I consider that moment to be a gift. 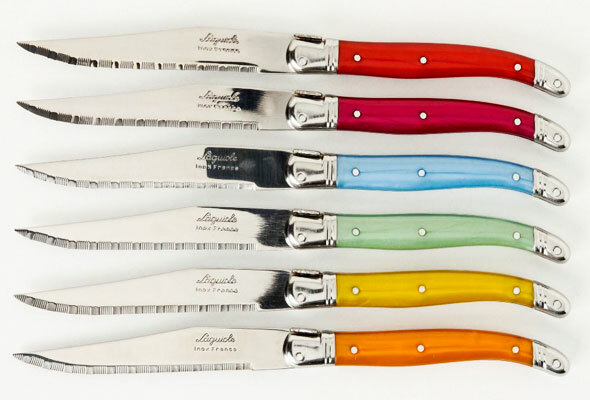 Laguiole steak knives are not currently available at Anthropologie, although the set of six knives in psychedelic colors is available elsewhere, including the very reasonably priced Whisk and, not surprisingly, at Amazon, albeit priced at a slightly more indulgent splurge. The knives can also be found in more muted colors at Wine Enthusiast. The full array of Laguiole steak knives, in traditional wood grain or crazy colors, can be found at the source, Laguiole. The design makes me think of an unfolded pocket knife. I’ll take the red one. Beth, it’s your turn to choose. The red is nice. I have to admit, I usually gravitate toward the magenta or the orange…. During baseball season, the orange is a good choice to support the Giants. Sounds like we could get together for a rib eye, and no one would fight over color choice. Hah! Sounds like it, Jackie G. Oh how I would love that…. If you think about it too much, a gift can become a sort of “test” questioning whether we really know and understand what our loved one might like. It’ll drive you nuts. If the gift is adopted, appreciated, or, better yet, falls into daily use, it is a hugely satisfying. It’s probably best not to overthink it. So relax, R. The knives are beautiful, E seems to like them, and they’ve found their place on your kitchen counter. I’d call it a win. Lovely counsel, Casner. Appreciate it. Renee, I see you’ve written a little ode to your Laguiole love. Nice to see it on the site. Many years ago, The Frenchman (you know who I mean) insisted on a set of six knives brought back from a trip home. However…they were most definitely not these beauties. They were Opinel. Classic folding camping knives with wood handles. Add a touch of rustic charm to the table, but they also rust like the dickens. Go figure, I’m now eyeballing this high-quality candy instead, and giving thanks for gifts big and small. I have a set of these and I can confirm that they are beauties! They cut through steak as if it was butter and they look fab. I actually have the full dinner set and love to mix and match—classic and whimsical at the same time. I have mine in a slightly different color range, but I think I’ve fallen in love with that blue. It took me a while to build up to a full set and there are still pieces (and colours) I want! That’s both the frustration and the satisfaction, yes, Lindy? The slow, occasional gratification? R~ I’m afraid that I’m an instant gratification junkie. I want them (especially the blue one) now! I have this set of knives, they are much more reasonably priced than the wood-handled classic Laguiole knives, and although the handles make them appear a less serious knife set, they are without doubt a Laguiole. Test-drive them through a steak or slice a tomato without so much as spilling a seed and you will adore them. They are very well-priced. I couldn’t agree more, Martha. And I definitely couldn’t have said it better myself. Go ahead and hate me. I got a set of these (though the colors are a little brighter) about 10 years ago for under US$20. I love love love them! Hate you?! I admire you! Nicely done! Just don’t tell my husband you found them for that price!